Water coolers from the HEATKILLER® CPU series are among the most popular and top-selling CPU water coolers. Ever since the launch of the first HEATKILLER® CPU water cooler in 2001, the series has been constantly improved and optimised. The HEATKILLER® IV presents the most extensive alterations, so far. The focus of innovation was the new cooling structure. 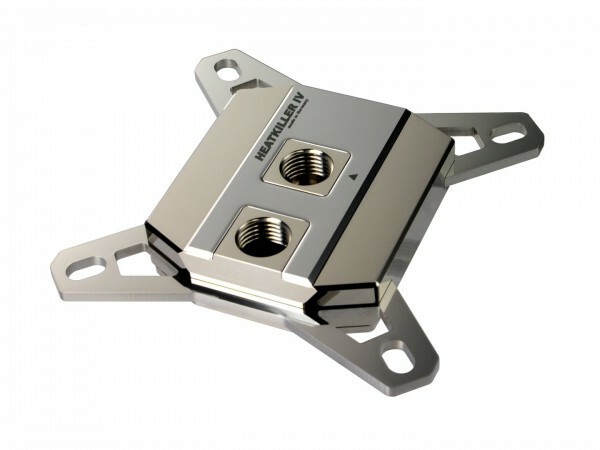 Finer micro fins greatly enlarge the contact surface of cooling liquid and cooler. Flow characteristics became optimised as well. These changes increased the cooling performance by up to 3°C compared to the predecessor. The flow efficiency benefits too supported by large-volume receptacles. The HEATKILLER® IV features a real high flow design, making it perfectly suitable also for lower performing pumps. By the way, the new cooling structure completely does without a jet plate. This improves the cooler's reliability because less dust particles can accumulate within the cooling structure. The HEATKILLER® IV also comes up with an improved feature set. This includes the comfortable Easy-Mount-System. After initial installation, the cooler can be mounted or de-mounted tool-free at any time without the need to dismount the mainboard as well. And the mounting brackets do now precisely define the contact pressure, thus mounting errors virtually do not appear. If you prefer big fittings, you will be glad to hear of the enlarged distance between the G 1/4” threads – which is now 25mm. This makes the HEATKILLER® IV compatible with all common thread types, up to the size of 19/13. The HEATKILLER® IV is a product “made in Germany”, manufactured on state-of-the-art CNC machines at the Watercool headquarters. Hello, yes this Watercooler is available for socket 1151. We will change the discription. Prodotto eccezionale ,usato per raffreddare un 7940x ha portato dieci gradi in meno di un aio 280.Super water block.